« A Wallaby? In Bedfordshire? It’s the Whitsun Bank Holiday weekend, and the weather has been glorious. The village open-air swimming pool opened for the summer today, and it’s been warm enough for Scarlett and me to have a splash around. In fact, it’s the first weekend for ages that it’s been both light enough in the evenings and pleasant enough weather to go out. I haven’t been out lately, due to family commitments. Badger watching time coincides neatly with bedtime for a three year old, so that’s curtailed things a little. But today was too nice to miss. Mrs BWM wasn’t working, so I asked her to take my parenting duties and headed off to the wood to see if the badgers were still around. After successfully breeding last year I’m less worried about them, but I still wanted to get out. The bluebells are out, cuckoos are calling and it’s generally a nice time to be in the woods. 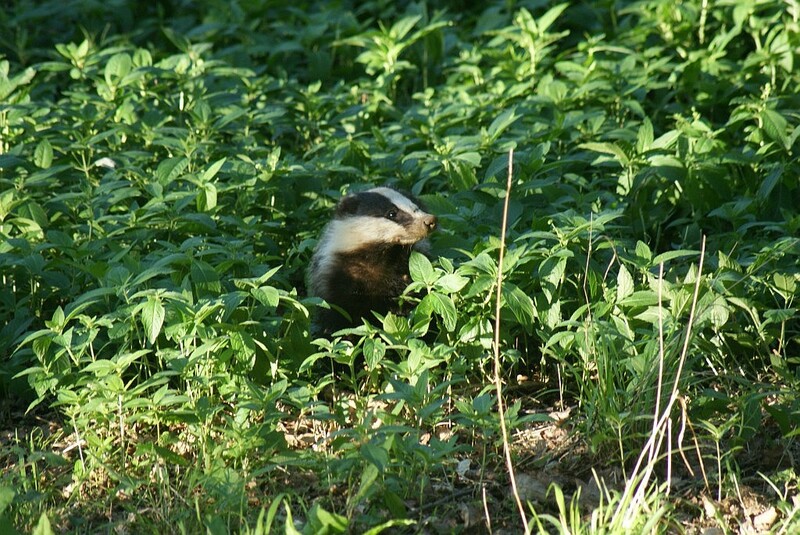 Anyhow, I counted five badgers, including at least one cub. Why do I say ‘at least one’ cub? Well, as always, badgers are damn difficult to count. They don’t stay still, they hide in undergrowth so you can only see part of them, and they’re constantly nipping off and coming back again. Hence I can be sure there was one cub, but there may have been more. The maximum number of badgers I saw at one time was five, so that’s what I’m calling. After half an hour or so the play stopped and serious work began. 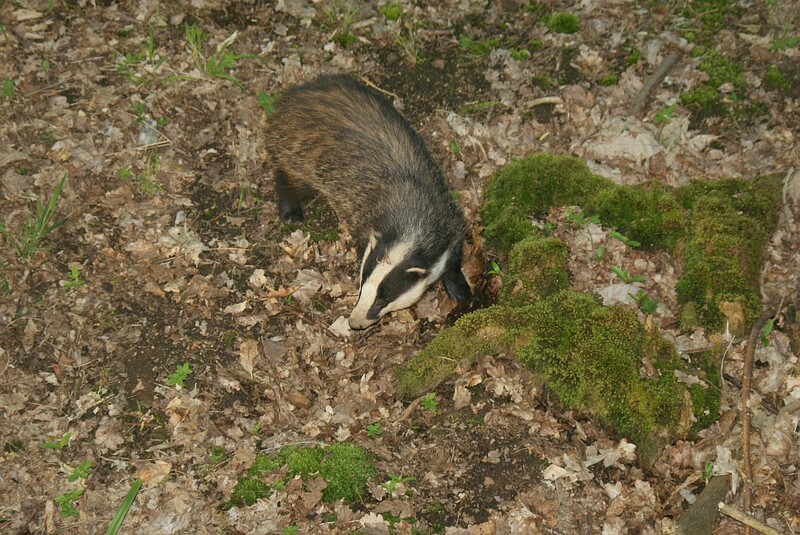 The badgers were collecting a lot of bedding, shuffling backwards with paws full of dead leaves. It occurred to me that this is the first dry spell we’ve had for a while, so they may have been taking advantage of the warm weather to get a clean, dry bed. As well as the bedding, they spent a lot of time foraging for food. This is always fascinating to watch. 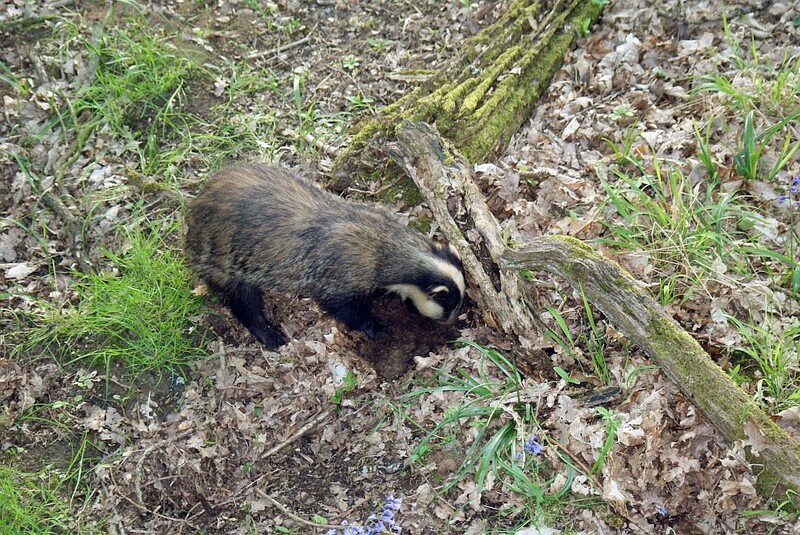 The badgers were snuffling in the leaves, digging out the soil and turning over dead wood to get at insect underneath. 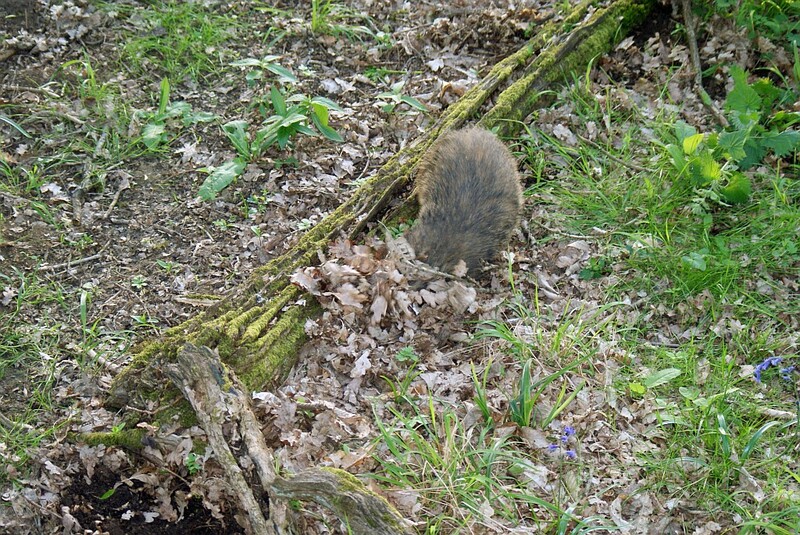 In the soft leaf mould they often seemed to be ploughing furrows with their noses to get at choice morsels. I was treated to some good close-up views. 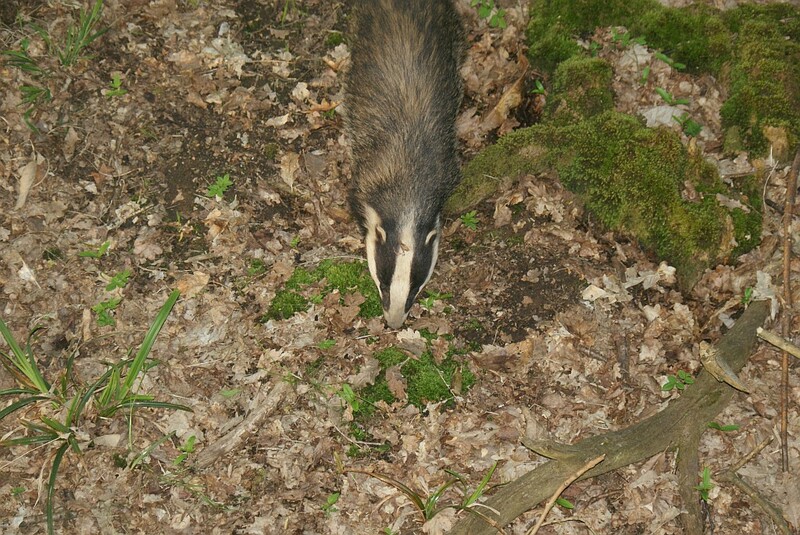 I was sitting in a tree with badgers snuffling around and underneath me – hence the unusual top-down view! As the church clock struck nine the badgers moved off. Time for me to go too. It’s good to know that the badgers are healthy and happy, and very good to spend time with them again. It’s good that you were able to get out again, BWM. The marsh badgers have been busily digging sett extensions this year.